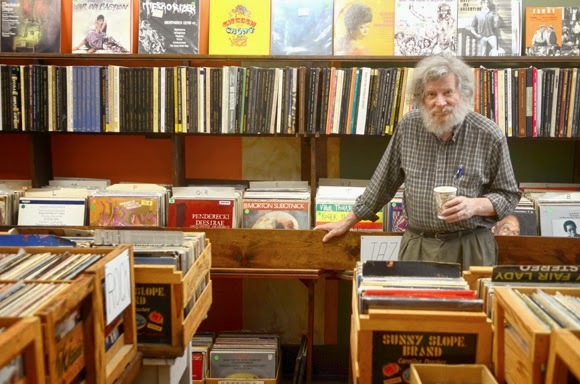 I was crushed when I found out today that the owner of my favorite Cincinnati record store, Another Part of the Forest, has passed away. Mike Markiewicz was a gentle, kind, soft-spoken guy. He had a real passion for music, no matter what type, and he knew about a little of everything. Ask him what artist you wanted to look for, and he'd point you to where you should look in the LPs (chances are that he had an album or two by them in stock). And he became well-known in the area for being the only record store proprietor to cut buyers a deal on multiple-record purposes. He didn't have to, but he did anyway. Most of the time, Mike was behind the counter, evaluating and pricing a new stack of albums. He spoke when he was spoken to and not much apart from that - but I think it's better than the alternative. In short, he really made the Forest feel like a welcome place to me and others who loved to hunt for records there. The shop will be kept open, with help from his family and Iris Book Cafe, but I don't think it will ever be quite the same without Mike. Nice record. Even nicer tribute... To quote an old friend; "We come, we do, we go."